Wow! 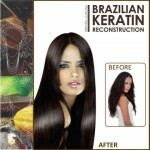 Excellence in hair is proud to now be able to offer Keratin smoothing services in our Toombul salon. Our treatment is the Brasil Cacau keratin treatment by Cadiveu which is one of the most innovative, effective and safest professional smoothing treatments in the world. It’s Exclusive formula combines raw ingredients such as revolutionary sugarcane cysteine and Acia berries. Giving an instant straight, smooth and frizz free result that can be manged from the moment you leave the salon. Unlike other systems on the market where you need to wait up to 72 hours to wash your hair, wear a pony tail or use clips/pins this system lets you leave the salon with a perfect easy to manage result instantly lasting up to 3 months. Apart from this another factor that sets Brasil Cacau aside from the rest of the systems on the market is that it uses no harsh chemicals (i.e. other systems use Formaldehyde which is a known pathogen of cancer) and at the time of writing is the only system on the Australian market that contains NO FORMALDEHYDE and has not been recalled by the ACCC. On top of having one of the best products on the market, we also are providing one of the best deals for Keratin smoothing services in all of Brisbane, Providing you the 3 hour Keratin service, Blow-dry or hot iron finish and all the home maintenance products to keep your new style in perfect condition for the longest period of time, all for only $495 for medium/ long hair and $595 for longer hair (extra long on consultation).